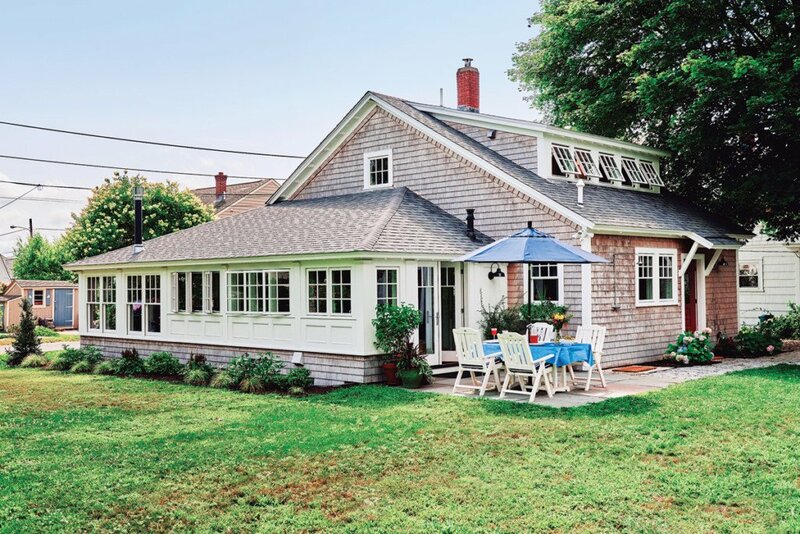 The Touisset Point charmer got a facelift from an architect who specializes in small homes. Hutchison accentuated the addition’s enclosed porch-like feel with pilasters in between the windows and shingles below. Photography by Tony Luong. Some architects would scoff at taking on projects that come in at less than 2,000 square feet. But for designer Katie Hutchison, author of The New Small House (The Taunton Press, 2015), smaller homes are often what she loves working on the most. “I enjoy the challenge of trying to get as much as I can out of a small space, concentrating on that space and doing it well,” she explains. So when the owner of a cottage in Warren’s Touisset Point neighborhood needed to renovate after extensive water damage from a burst pipe, Hutchison, whose eponymous studio is around the corner, was just the person to call. The home, which was built in the early 1900s, was in the family for generations. The first order of business was to rework the layout for better flow. To get the ball rolling, Hutchison designed an addition that would become the kitchen and would give the home some extra space without intruding too much on the owner’s coveted double-lot lawn. To make better use of the second floor, which Hutchison says was cramped thanks to low-hanging eaves, she widened the existing one-window dormer to include five windows, making room for an office and bathroom. At the front, the entrance was moved to one end of the porch to make way for more seating in the living room, while make-all-the-difference details like a swing and windows above add to the home’s curb appeal. A sliding door that closes off the hallway is the same style as the five-panel doors found in the rest of the house. Photography by Tony Luong. Hutchison worked closely with the owner, as well as Warren builder Sheridan Associates, to create a look inside that blended industrial, craftsman and cottage styles without leaning too much in any one direction. “The owner was very design-oriented and knew exactly what he wanted to obtain from the renovation,” Hutchison explains. While the renovation was extensive — “We were down to the studs,” Hutchison recalls — efforts were made to salvage as much of the original materials as possible. 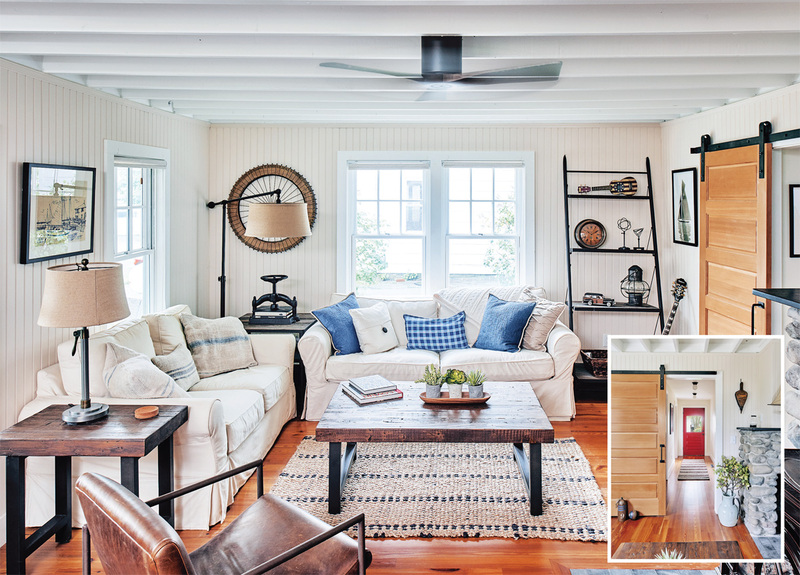 In the living room, which now has room for a couch thanks to the relocated front door, the beadboard, exposed framing on the ceiling and stone chimney were all kept intact and a wood stove was replaced for easier heating. The floors, southern yellow pine beloved by the owner, didn’t fare as well, having been badly water damaged. But Hutchison saved the day, sourcing salvaged flooring in the same material and patina to replace what had to be ripped up. Thanks to the relocated kitchen, a new hallway just off the living room now leads to a den and utility room with washer and dryer, which used to be stored outside. A mirror by Warren’s O and G Studio hangs by the front door, while the whales above the banquette are by Grainger Pottery in East Sandwich, Massachusetts. The kitchen addition made room for a den at the rear of the house. Photography by Tony Luong. One of Hutchison’s small-space design strategies calls for creating what she describes as a “pocket for privacy” within a room. “It’s an area where you can tuck away, pull yourself out of the milieu and hang out,” she explains. The banquette plays this role in the kitchen addition. Hutchison kept the area’s look consistent with the rest of the space by using the reveal channel board found in the kitchen at the back of the bench and the mahogany that appears as beams on the ceiling to make the bench base and table. Chairs by Warren’s O and G Studio in the same “Wayland” style as the higher versions at the kitchen bar are just two of the many locally made items found throughout the house, while a wood stove ups the cozy factor exponentially. The quality of materials was a key consideration in the look of the kitchen and, according to Hutchison, should always be when you’re designing a small space. The owner decided where he wanted to splurge — soapstone counters, mahogany beams and the jatoba wood bar — and where it was okay to spend a little less, like the simple cabinetry and plaster ceilings. The beams are a trompe l’oeil that break up the room, making it appear larger than it is, explains Hutchison, while the view outside, via closely grouped windows, does the same. In her book, The New Small House, Hutchison outlines ten design strategies for maximizing small house space, almost all of which she used in this cottage. Hutchison’s next book, The Cottage, Now (The Taunton Press) is due out in the fall of 2018.